That after-work place with drinks and nibbles where everybody knows your name gets even cozier when half of the guests are wearing collar nametags. Yappy hours give dog owners a chance to socialize over a brew while their pups mingle over treats and toys. Host your own instead of waiting for a local business to have a pup party. Yappy hours are often hosted by hotels, bars, apartment complexes or breed play groups. Anybody with the right venue can host one from a cul-de-sac for a neighborhood block party-style bash to a dog-friendly backyard fiesta. Invite owners whose dogs mingle well with others and reserve the right to expel a canine who is too aggressive. Limit guests to two dogs per person so that nobody is trying to manage a pack, and ask owners to not bring their pets on retractable leashes so pups are easier to control. Keep a leash on the size of the event by asking invited guests to ask the host before inviting additional people and their pets. Make the event off-leash only if you know you have a group of friendly dogs and a secure area, such as a playroom at a doggy day care facility or fenced backyard. Let pups indulge in delicious treats while keeping mess to a minimum. Doggy ice cream or ice pops in summer can compliment mimosas or margaritas poured for their people. Rich foods can cause stomach upset in sensitive pups, so keep homemade treats simple such as chicken and rice meatballs. Pour store-bought treats into bowls yet keep the bags on the table so owners who know what their pets can and cannot tolerate are able to check for ingredient information. If hosting a patio or block party on a warm summer's evening, consider adding a wading pool or two far enough away from the human food and drinks for when wet dogs shake it off. Put fresh bowls of water on the ground by the doggy treat table. Entertaining expert Mark Addison recommends "martinis" for the pups: plain water in a stainless steel martini glass garnished with a dog treat. Take a cue from some of the most popular yappy hours across the country and collect donations for a local animal shelter such as cash, cans of food or toys. Arrange the spread for people next to the bar or drink table in a different area of the venue than the doggy snacks. Avoid serving people noshes with ingredients that would be hazardous to dogs, including onions and chocolate, in case the food is dropped and consumed by a hungry pup or generously shared by an owner. Put a fun spin on the menu with a crockpot stew with cubed beef and veggies -- the human, edible version of what's in that pop-top can that feeds your pooch. Make cookies in the shape of bones, serve munchies in clean dog bowls or grill gourmet sausages to fill the air with a smoky scent that invites both humans and canines. Put tunes with "dog" in the title or artist's name on the event's playlist. Where there are so many dogs enjoying playtime and treats there are inevitably going to be accidents. To keep the event as sanitary as possible, provide poop bags, paper towels and a special covered waste receptacle far from the food and drink. 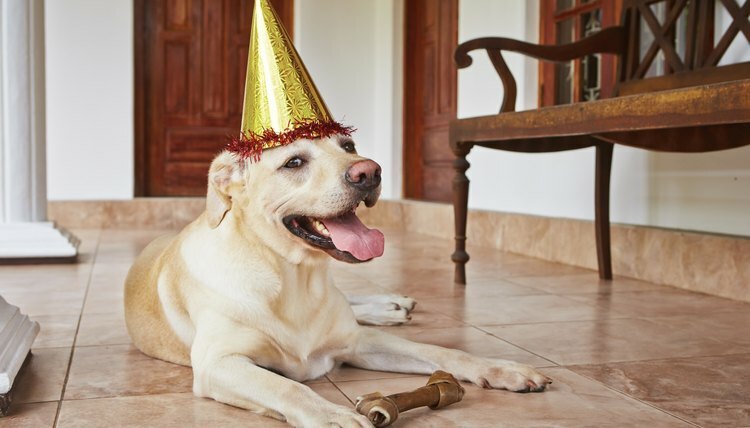 Keep a bottle of hand sanitizer next to the trash so that guests who responsibly clean up after their pooches can go right back to enjoying the party. Have a different type of doggy bag on hand for guests to take home leftover treats at the end of the evening -- label them "pup" and "people," even though a dog will take both. Mark Addison: Yappy Hour – A Happy Hour for man’s best friend!